Also see the collection of complete Devoe Airlines timetables. 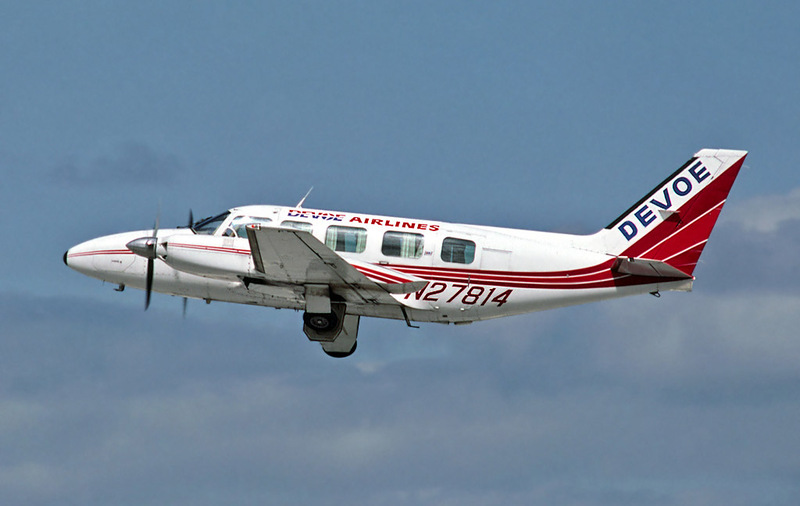 Devoe served various points in Florida and Alabama from 1981 through 1983 with a fleet of Piper Navajos. The airline shut down in 1983 when the Drug Enforcement Administration discovered the company was basically a front for a Columbian drug trafficking operation. Owner Jack DeVoe was convicted in 1984. Pilots testified that they often carried drugs in the wings of Devoe aircraft and found that the best time to unload them was during Miami Dolphins games when drug agents where busy watching TV! Below: Navajo N27814 departs Miami in March 1983. Photo courtesy of Bob Garrard. Devoe Airlines timetable from August 15, 1982 showing destinations in Florida and Alabama.